This is the first in a series of blog posts about the wonderful sponsors of the 9th Elysian Winter Beer Festival. Alex, Dan and Stuart at the Three Blind Mice Brewery have very kindly agreed to sponsor the glasses at the 2018 festival, so keep an eye out for the eye catching designs – they will make a great souvenir of the festival. The Three Blind Mice Brewery is tucked away down Black Bank Road between Little Downham and Littleport on a small industrial estate (CB6 2UA). I have to admit having cycled past the site numerous times on the way to work in Littleport without even realising that such a fantastic brewery was only a few yards away from me, or I might have stopped by more often! The brewery started from small beginnings – home brewing, followed by brewing in a shed at the bottom of the garden (3 years of experience home brewing and using real hops) and then the realisation that this new found passion for brewing could become a viable business proposition. The name came from the fact that there were three founders of the business and in the beginning it was the “blind leading the blind” as they moved forward in establishing their first business together – therefore it was an obvious choice of name!! Alex, Dan and Stuart took on a unit at Black Bank Road in January 2014 with the philosophy that they could afford to buy the equipment and rent the premises and even if they could not sell the beer, they would have plenty of free beer to drink – a great attitude and one that has served them well. Good fortune at the site enabled them to expand in March into new premises and they now brew 8 times a month and have the capacity to produce 20,000 pints a month – only the number of hours in a day stops them producing more than they do currently, although this will improve when Dan starts working in the business full time soon, alongside Alex. The core beers produced by Three Blind Mice are Milk Worm, Juice Rocket, Old Brown Mouse and Lonely Snake, although they have produced about 80 different beers all told and are still going strong. Watch out for some special beers at the festival where Three Blind Mice will have a Brewery Bar. I personally cannot wait to try them. The beers have won several awards and Milk Worm recently won the best overall beer at the Norwich Beer Festival. So you say, where can I get hold of these beers – in Ely they can be sampled at the Drayman’s Son, 3at3, the TownHouse Pub and the Prince Albert (all of whom are sponsoring the Beer Festival). There are also numerous pubs in Cambridge, Norwich, Lowestoft and Stamford which serve their beers. Unfortunately, the beers are not available in bottles as yet but this could be on the horizon if the demand is there. I went there with empty panniers on my bicycle hoping to bring a few bottles back, but came home empty handed although I have to admit trying a sample whilst I was there – it would have been rude not to! There are to be some exciting developments soon – including the possibility of a tap room – that may well increase the time it takes me to cycle home from work and a very exciting development which is under wraps at the moment but keep watching this space. Many thanks to Alex and Dan for hosting my visit to the premises and we wish you the greatest success for the future. 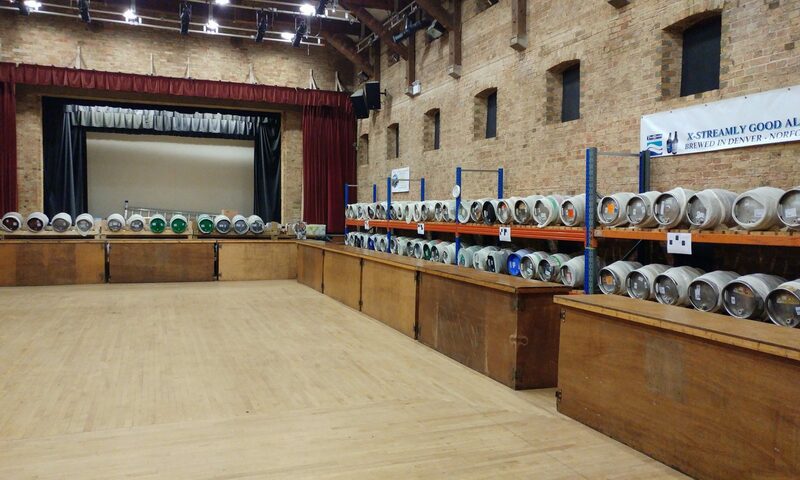 We are really looking forward to see you and your beers at the Festival – see you in January.